CHAMPION SON OF SEATTLE SLEW!!! TIMOTHY J. THOMPSON has earned both a Bachelor's and a Master's Degree from the University Of Missouri St. Louis, A very fine institution of higher learning. He has always loved the sport of thoroughbred horseracing. He considers the thoroughbred to be the greatest of all athletes. He was first introduced to their greatness in 1975 when his father took him outside, and together they measured the mammoth stride of the immortal SECRETARIAT. As it turned out, SECRETARIAT'S stride was two feet longer than the Thompson house was wide! Two years later, in 1977, TIM'S love and admiration for the thoroughbred reached an all-time high when he watched the immortal SEATTLE SLEW win the coveted Triple Crown with an overall undefeated record of 9 WINS and 0 DEFEATS. Right then and there, SEATTLE SLEW became Tim's greatest athletic hero, and remains so to this day. 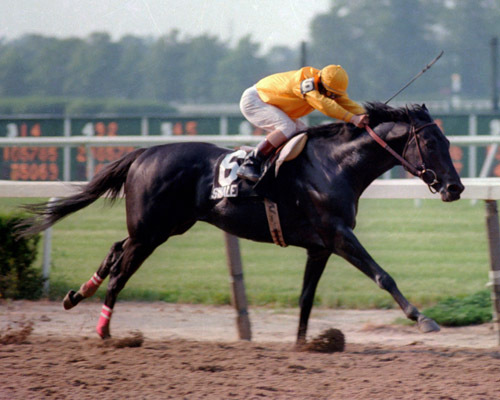 SEATTLE SLEW was not only a phenomenal racehorse, that is just scratching the surface of his talents. He was also a tremendous stallion. Right off the bat, he began producing champion sons and daughters at a fever pitch pace. His very first crop alone would contain more than a dozen stakes winners! That is simply incredible, as well as unprecendented. These included: SLEWPY, his very first stakes champion, the filly, LANDALUCE, his first great superstar, two-time Eclipse Award winner, SLEW O' GOLD, and multiple stakes winner, SLEW CITY SLEW. SEATTLE SLEW'S second crop of foals, born in 1981, contained SWALE. He was Tim's all-time favorite offspring of SEATTLE SLEW. SWALE had so much heart. He had so much courage. SWALE'S great and numerous victories brought so much joy into Tim's life. Then, SWALE'S tragic and untimely end ripped his heart out. It was a long time before he was able to watch any thoroughbred horse races. It just hurt too much. For a time, he quit watching the sport altogether. Eventually, he did get back into it. For many years, Tim felt very strongly that SWALE never fully received the respect and recognition that he truly deserved. That is one of the main reasons why Tim undertook the project of writing a very detailed book about SWALE'S life. He wants more than anything for SWALE to be remembered for the Great and Wonderful racehorse and living being that he was. As a result, and to that very end, he created this website and wrote his wonderful book for your personal enjoyment.